Happy New Year to everyone here who posts, comments or simply lurks. It’s all appreciated and particular thanks to those whose contribution in the posting and commenting areas has made the site as enjoyable as it is. First off, thanks to WBS, who ensured there was a post on every edition of the Sindo this year. We’re making no promises for 2012 though. Secondly, bit depressing to be able measure out your year in Sindo-sized chunks, but there you go. I suppose this year there were several topics guaranteed to provoke stupidity – the continuing economic crisis and the troika, the southern election, the queen’s visit, plus the inherent inanity of the Sindo’s outlook. My personal favourite theme in the Sindo this year, though, was the slipping of the mask of cosmpolitan pluralism and the repeated emergence of what can be best described as the Sindo’s version of the Little Englander mentality. Now, for some nostalgia, in broadly chronological order. Eilis O’Hanlon made an early – and possibly successful – bid for this year’s title on January 23rd, with this cri de coeur from the bourgeoisie. As it happens, Joe Higgins was wrong as well — and not simply because of his fetishistic obsession with the woes of the working class at a time when any fair-minded analysis would have to concede it is already struggling middle class homeowners who are bearing the brunt of this recession, and whose children, educated at great personal expense and sacrifice, are now emigrating, according to the ESRI, at the rate of 1,000 per week. Marc Coleman, though, made a bold claim for the same territory on May 15th. Once again the politically weakest constituency in the country — Middle Ireland — has been made to carry the can for the mistakes and selfishness of others. The election produced probably the statement I enjoyed pointing out the most all year. But before that, Shane Ross on March 6th, addressing the loss of economic independence. Angela, the European Union and the IMF have filled the vacuum vacated by David Begg, Jack O’Connor and Ictu. The Sindo likes to present itself as a bastion of democracy. Shame its people don’t seem to grasp how elections actually work, and what the word “most” means then. And so to my personal favourite from Jody Corcoran on March 6th, after which it became totally impossible not to laugh anytime the Sindo started on about democracy. Another certainty is that the people voted for Fine Gael, but they did not vote for it in sufficient numbers that it would win an overall majority, it having fallen seven seats short of a majority — just seven. It is beyond doubt, then, that most voters wanted a single-party, right-of-centre government, but that they were looking for something else too, something small but perceptible. By June 5th, he had changed his mind about most people wanting a single party government. Not sure that he had gotten what the votes meant yet though. I am, perhaps, alone in holding to a theory that the electorate did not vote for a Fine Gael/Labour Government. It voted for Fine Gael with a few like-minded Independents, and for Labour to lead the Opposition — an important role. There was also a statement from someone else during the year who seemed to think that UK voters had flocked to the Tories in an election they hadn’t actually won. Maybe this will be the year that they grasp basic arithmetic. The queen’s visit offered a potential feast of stuff, but Louis Jacob on April 3rd can stand in for the rest of it. It should be an historic event, that brings to a close years of problems. Let’s not forget the public sector. Marc Coleman on July 19th had this to say. Last Tuesday night, Brendan Keenan and I paid tribute to Brian Lenihan on Newstalk. In the course of the discussion, we touched on the bank bailout. Both of us agreed that despite the awfulness of its cost, it is a one-off cost when compared to the ongoing crisis in our public finances. Interesting use of the word one-off. And interesting use of numbers too when you think about this argument. Brendan O’Connor on July 24th showed us he has no grasp whatsoever of what actually makes up the public sector that haunts him so. So the public sector is sorted. Its workers will maintain the 47 per cent premium they enjoy over their colleagues in the private sector, and they have total job security. So however horrific the upcoming budget, they can all rest easy. The public sector will not be downsized unless it wants to be. So while we cut services to the old, the sick and the disabled; while we compromise our education system, the major thing we should be investing in now in order to capitalise on the next boom; while the Government has taken to stealing people’s pensions in order to balance the books, the public sector has been ring-fenced. That man is a buffoon. And so to the Sindo’s Colonels Blimp. James Fitzsimmons on December 18th. Now for an appearance by Harris. Anne Harris on May 29th. For your information, Eamon, the French small and medium businesses do not give a fig for us or our corporation tax. Nor does their government. Just as during the Second World War when all they cared about was the coffee in their cup and the sugar in their coffee, now all they care about is corporation tax and the quality of their life. The French don’t care about anybody but the French. And the only people they kowtow to are the Germans. They always did and they always will. And when it all falls down (like it did with Vichy) they will say they (the Germans) made us do it. Germany will soon have the Europe it has always wanted. A Sunday, apparently, to remember that petty-minded, petty-bourgeois nationalism isn’t backwards and bad when it sounds like the UK Independence Party rather than an Irish independence party. But this year’s winner, from a crowded field, is Ruth Dudley Edwards on September 4th, who wins for the mixture of right-wing authoritarianism, complete disregard for democratic and human rights, class snobbery, paranoia, and self-loathing inferiority complex that typifies the Sindo at its finest. Vanessa Redgrave is a fine actress and a notorious idiot who for years supported the Workers’ Revolutionary Party. Among those threatening violent opposition to the evictions are international anarchists spoiling for a fight. If any Traveller gets hurt, the victim card will be played and concerned Irish and UN voices will chide the authorities for their repressive actions. Better luck to the other contestants next year. Jason O’Toole has an interesting interview in the Mail with soon to retire Dean of St. Patrick’s, Robert McCarthy. ‘It’s a great banner headline for saying what you think. You see, I’m a boat rocker,’ he says about the association with Swift, when we meet in his study at the Deanery, only a stone’s throw from the cathedral. It isn’t lost on me that it was probably in this very room that Swift penned some of his most contentious polemic writings. Since taking up the post in 1999, Dean MacCarthy certainly has marked himself out as being similarly controversial. He recently caused uproar by describing Islam and Hinduism as ‘cults’. Bar M83, Ulrich Schnauss and Jonas Munk, Steve Kilbey Martin Kennedy, the Horrors, The Go! Team, Photek, Roll the Dice, Luca Bachetti and Toro Y Moi [I think] most of the music here is from times past. So don’t look to me for a round up of best/worst of 2011, though it’s not like I didn’t hear enough albums from 2011. Wire’s “Red Barked Tree” was pretty good, VNV Nation’s “Automatic” was grimly awful, R.E.M. would have been better off to have disbanded a decade earlier, Kasabian could follow suit, but this is stuff I listened to a lot this year whether it was from this year or not. In some cases for the first time, in some not, and just enjoyed listening to more than once, twice or three times. As recommended by EamonnCork, a classic [which I hadn’t listened to in the best part of fifteen years], little more to be said, other than if you ever get the chance to hear their early 2000s reunion album give it a go. Very joyous. On then to 1973 and Fine Gael ad “In one year her grocery bill has risen 14%. But her housekeeping money hasn’t”. Then some from the General Election earlier in the year…. Then two of the stranger ones…. Posted by WorldbyStorm in British Politics, Irish Politics, Northern Ireland, Sinn Féin. Only just had a glancing look at the detail emerging in both Irish and British media about the release of State Papers from 1981 [and Michael Carley noted this BBC overview here for which many thanks]. A different world, little doubt about it, populated by characters most of whom have departed the political stage. Most. The detail about the Hunger Strikes is of particular interest but will require considerably more analysis. What seems most evident is how much wasn’t known on all sides about what was happening. That in no way lets people – any people – off the hook but it suggests that the seeming chaos wasn’t just seeming. And one thing I still recall from that period, a sense that almost anything could happen on foot of the mobilisation politically in the North, seems to be reflected in these papers. And thinking about it, given the subsequent history, who is to say that in a way that wasn’t borne out by the most recent dispensation? Another point is that despite the rhetoric the British government ultimately, as indeed was shown subsequently, was willing to act more rather than less pragmatically. What’s also interesting, though perhaps can be categorised as musings, is this report that the British felt that the events of the Hunger Strikes might be pushing towards unity. The Thatcher government wobbled in its resolution to resist the IRA’s Maze prison hunger strike and contemplated the “unpalatable” option of British withdrawal from Northern Ireland, according to secret cabinet documents. But it was the prospect of an intervention by the previous prime minister, James Callaghan, which caused most anxiety. “The difficulty of the government’s position seemed certain to be increased by the evolving opposition attitude towards Irish unity as an ultimate objective,” the document said. It was thought Callaghan was about to make a speech proposing that Northern Ireland “should become independent, with transitional arrangements under which British troops and British financial assistance would remain available for a limited period. “His [Callaghan’s] views might well receive massive support from public opinion in Britain, where there was already a widespread feeling in favour of British withdrawal,” it said. But note the substance. The British government was most concerned in the specific about a Callaghan intervention. So yes, the events on the ground in the North were pivotal, but from a London centric viewpoint events closer to home, which never occurred, obviously, had a greater potential traction. But withdrawal was likely to result in “civil war and massive bloodshed”, with the Troubles spreading to British cities with significant Irish populations, the ministers present acknowledged. Interesting that reference to western Scotland. The then taoiseach – days after being elected to office – told the British prime minister his government’s view of her handling of the crisis was starting to converge with that of the IRA. “This is naturally the last position in which we would wish to find ourselves,” he said in a secret letter, just declassified under the the 30-year-rule. It’s not, of course, that in any real sense there was a convergence of thinking, but that in functional terms driven by politics the fear was that an Irish government would have little choice but to – for example – take measures such as cutting security relations because of the approach of the British government. Meanwhile the self-justifying analysis of a certain former Senator might well take a bit of a knock from the following. THE BRITISH embassy in Dublin produced a lengthy report on the relationship between the Provisional IRA and the Irish media, following a claim that RTÉ had been infiltrated by republican sympathisers. This followed the claims of an FF mayor of Cork, Paud Black, who asserted that RTÉ was full of PSF sympathisers. British diplomats were sceptical about the veracity of Black’s claim. They had believed that the group which had most sympathisers in RTÉ was Sinn Féin the Workers’ Party (the stickies), who were “bitterly anti-Provisional”. Indeed to put a rather different spin on what has become a trope even beyond the good Senator’s offices they pointed to other parts of the Irish media for sympathisers. While Whiteway did not believe there were many IRA sympathisers within the national broadcaster, he did suggest that there were a “scattering of them in the newspapers and magazines”. Of these, he claimed the “best known” were Ed Moloney and Seán Cronin in The Irish Times , Deasún Breathnach in the Irish Independent , Vincent Browne and Gene Kerrigan in Magill , Eamon McCann and Gerry Lawless in the Sunday World and Paddy Prendiville in the Sunday Tribune . That said, it was also made clear that “the presence of journalists sympathetic to the Provisionals does not seem to have affected the editorial line of the main newspapers and magazines with the exception of Magill ”. Most newspapers remained “bitterly anti-IRA”. Hmmm… quite a different picture from the one of an heroic effort to hold back the tide of PSF sympathisers inside RTÉ – no? And certainly one that for those of us deeply sceptical about his and others claims about that period will hardly burnish his credibility. And there’s more. The British state papers themselves are fascinating for the detail on the 1981 riots, not least the way in which in this instance ideology seemed to trump pragmatism – or even compassion, and there was little or no support for Heseltine’s efforts to regenerate inner cities. The cabinet papers released by the National Archives under the 30-year rule reveal Thatcher’s closest advisers told her that the “concentration of hopelessness” on Merseyside was very largely self-inflicted with its record of industrial strife. The files show that when Michael Heseltine pressed the case to save Britain’s inner cities with his cabinet paper, It Took a Riot, they ensured his demand for £100m a year of new money for two years for Liverpool alone was met with a paltry offer of £15m, with the condition that “no publicity should be given to this figure”. Although they never articulated the case publicly at the time, those telling Thatcher that there was little point in spending money on Liverpool also included the industry secretary, Sir Keith Joseph, and her Downing Street advisers, Sir John Hoskyns and Sir Robin Ibbs. Howe told Thatcher that Heseltine’s plan for a cabinet minister for every deprived region should be restricted to a one-year lone experiment in Merseyside after arguing that if there was any extra money he would rather spend it on the more promising West Midlands. He decried Heseltine’s role as “minister for Merseyside” as an attempt by the latter to create a “godfather role” for himself. The cabinet papers also show that a panicky Metropolitan police commissioner, Sir David McNee, told the prime minister at the height of the Brixton riots in July that he was unable to guarantee the security of the royal wedding of Prince Charles and Diana Spencer, which was due to take place the following month without the introduction of a modern-day riot act. He raised the stakes by telling her that he had already raised it with the Queen. McNee presented Thatcher with a list of equipment he needed including riot shields, water cannon, rubber bullets and armoured vehicles – preferably painted blue rather than kept army grey, CS gas and even a “heli-telly” – an early mobile surveillance helicopter – during a midnight visit to Scotland Yard. In this respect the past is the present. Anyone see anything else of interest in these papers? There is some irony in left-wing TDs being so trenchantly opposed to a property tax. It would be interesting to see how the State broadcaster reacted if a group of TDs organised a campaign for non-payment of the television licence fee of €160 a year. Not the same thing and the rationale for campaigns around the household charge as against such licenses is dealt with in yesterday’s post here. The experience of the 1980s has taught us that, insofar as it is possible, extra taxes should not be imposed on work but on fixed assets like property. The Commission on Taxation, which reported in 2009, was in no doubt that this was the correct approach and it recommended that €1.2 billion a year should be raised through a comprehensive property tax. At the start of the 1980s the top rate of tax was 56%. Okay. But, according to CSO figures [by way of ICTU] in 1992 the top level of income tax was 52% in 1992. In 1993 it was 48% where it remained until 1999. It then dropped to 46& in 99/00 and then to 44% in 2001. In 2002 it dropped further to 42%. That delicate creature, the Celtic Tiger, somehow survived an entire decade of the 1990s where the top income tax rate was in the 50s through to the high 40s. And Collins seriously expects us to believe that increasing tax to – say a median point of 46 -48% would somehow constitute 1980s rates? Moreover if he doesn’t believe that growth is possible at higher rates, he should again peruse the CSO figures and note that in 1994 [Top Income Tax Rate – 48%] growth was 6.3, the next year 8.3, the next year 7.8, the next year 9.7, the next year, 1998, 7.9. Two years later at 46% it was 10.2. Indeed inconveniently for his thesis [and I make no great claims for absolutely causality here, but am merely taking it on the terms he frames the discussion] in 2001 when tax had dipped to 44% growth fell to 3.8. In 2002, at 42%, it fell to 01, and thereafter was 2.5% and 4.3%. Just for clarity, the standard rate of tax was 30% in 1990, fell to 27% by 1992/3, remained there until 96/97 when it was reduced by 1%, then reduced by 2% in 1998/9, 2 % in 00/01 and then stabilised for the rest of the decade. In other words we could increase taxes from where we currently are to mid 1990s levels when the economy was growing significantly. To suggest that the only alternative is massively higher rates of taxation or what we now have is frankly disingenuous. The €100 household charge is just a fraction of the kind of property charge recommended by the commission which proposed that the lowest rate of tax for houses worth less than €150,000 should be €188 a year with more than €900 a year for middle-range houses. Except we know that that’s not the level that the household charge will stay at, though curiously and tellingly the government is remarkably vague on just what levels (and structures) it will actually have. One thing we can be sure of is that it will be higher than currently set. The Government is highly unlikely to endorse a property tax on that scale, as it would certainly impose a crippling burden on a lot of people who would be unable to pay such steep charges. However, some form of property tax is necessary. not only to raise revenue but to limit property prices in the future. The flaw in the flat rate €100 charge is that, modest as it is, the same rate applies to every house, big and small. Which is precisely the point. However he sees light on the horizon. That state of affairs, however, is likely to last for just a year with a graduated system taking either valuation or size, or a combination of both, coming in to replace it, possibly as early as 2013. ‘Likely’, ‘possibly’, all very vague and profoundly unsatisfactory given the regressive nature of the interim measures. The irony is that there would be far less fuss if income tax had been increased in the budget on a scale that would have brought in 10 times more than the household charge. But the point is that income tax increases would be at least progressive and based on ‘ability to pay’. That Collins can’t see this suggests he can see nothing in relation to these matters. But for him it’s not his own short-sightedness that’s at issue but rather as he puts it in a portentous fashion. That is a reflection on our political system and the shallowness of so much of the debate about the state we are in. No it is not, it’s a reflection of the fact that the current proposal is regressive and consequently unfair, that it is the thin end of a wedge, that the experience of bin charges demonstrates that supposedly iron-clad waivers for those on lower incomes are easily jettisoned when it is expedient to do so. And all he does is point up the now fetishistic attachment of much of the commentariat, our largest political formations and indeed the upper middle class to avoiding income tax increases at all costs. Of course they’re right from their perspective, because progressive income taxes will, by definition, require them to make a greater contribution than they currently do. That they do everything that they can to wriggle away from them tells one all one needs to know about where they stand in this conflict. It’s intriguing how the information on the water charges is beginning to emerge.Though again it is tellingly vague. There won’t be a ‘flat charge’ for usage, that much we are told. But what will there be? The Irish Times suggests that it will be set between €250 and €400 per annum with a level below which there will be no charge incurred. But this seems like a recipe for distortions and contradictions. Households with larger numbers will use larger amounts, and how is that then tallied with income? 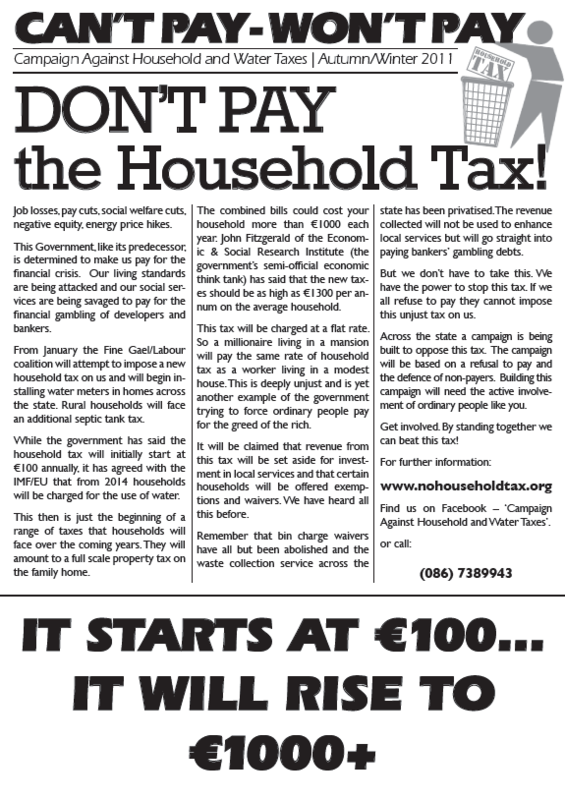 So this too seems likely to be profoundly regressive – particularly if the spread of charges is only between €250 and €400 [not to mention the contradiction inherent in the rationale extended by Collins et al that such taxes are revenue generating/broadening the tax base and the supposed need for them to cover the costs of utility supplies]. And as with the household charge the concept of ‘ability to pay’ appears to have been largely stripped out, bar its most cosmetic application, from the issue. On a related note one has to smile at Noel Whelan’s thoughts in the same edition of the Irish Times. Is he merely being provocative when he argues that the Government should ‘ignore polls and take bold measures’? Or is he presenting seemingly plausible, but politically combustible advice, on behalf of his former political colleagues? Either way when one considers the unhappy history of the previous Coalition it seems dubious that ‘bold measures’ will resonate with the public. Our new Government has a massive parliamentary mandate. As long as it can agree between the two parties, it is assured of a full five-year stint in power. It has the advantage of being able to think and act in at least the medium term. It should be frontloading the implementation of their programme for government. It should be leveraging the economic crisis as a basis for effecting radical reform in the public sector and political system. Given that all these latter measures are effectively short hand for ‘cuts’, because that’s the badge of ‘courage’ in our contemporary system, at least on the centre right, it’s intriguing to compare and contrast with the latest advice from the IMF issued this last week or so which which points to Ireland’s ‘fragile’ economy and the necessity to eschew any further cuts in order to stimulate growth. Yeah, that’s a great strategy Noel. Just great. I had assumed Christmas being a Sunday meant there would be no Sunday Independent. Clearly a product of my absence of the go-getting mindset required to be top businesspeople like the people who run the Sindo. People like me are the reason the country’s in the state it is, clearly. Not huge picking this week in what seems to be a slimmed down edition, but good to see that the year is ending as it began for the Sindo. The unions are destroying us all says Carol Hunt. But when the prospect of a downturn was imminent they were all hands on deck again as they deftly masterminded the ring-fencing of their already artificially inflated salaries and pensions (benchmarking II) for the foreseeable future. And so the extraordinary Croke Park Agreement was born — which may consign more than half the country to poverty, unemployment and desperation — but happily for its architects — not the half that matters to them. Maybe Santa will bring the Sindo a new broken record for next year. There’s a brilliant line in a letter to the Irish Times last week about the Household Charge. The letter attempts to draw a comparison between the charge and TV licences, etc, arguing that because they’re flat then the charge is legitimate. I can’t understand why Mr Higgins has never protested at the unfairness of some other “flat” taxes, such as the following. The TV licence fee is a €160 annual flat tax on every household, regardless of house size or income, or the number of TVs owned (Joe Duffy and Pat Kenny please note!). Annual motor tax is based on engine size, no one is asked what their income is; indeed, the changes in 2008 make it cheaper for those better-off motorists who can afford newer cars. That sort of misses a number of points – not least that such fees are regressive and progressives are [in general] against them and are [generally] in favour of income taxes. Then there’s the issue that the new charges exemplify aspects of contemporary economic and social policy in a particularly pointed way, in a way which is much clearer than a – currently – quixotic campaign against TV licenses or whatever. Then there’s the further issue that although starting at €100 we have no real sense of where these charges will end in terms of how large they may be. Then there’s the issue that although we are promised they will be progressive – copyright P. Hogan, given the lassitude on the part of the government to date on the issue and their abysmal portrayal of VAT increases as not impacting on those on median and lower incomes what credibility should we afford their protestations. There’s also the issue that the backlash started by the left has actually engendered responses from the government which are shifting towards clarity on the issue. That in itself is all the justification needed in a democracy for protest and opposition. Though from the howls of upset in the media one would think that the left was committing the worst form of lese-majeste in daring to query such policies. As was also put to me this week, if the left complains about an issue such as flat tax the criticism is raised that they’re not looking at issues x y and z, if they contest issues x y and z they’re told they’re against everything. By the way Mick Wallace has a not bad letter as well which can be read at the link above which points out that – er… if grandstanding were done on the issue it was done by Fine Gael who adamantly opposed a ‘flat rate charge’ in their election manifesto. Well actually, with a flat tax that’s precisely the problem. There those with more income are getting those with less income to pay proportionately more relative to their incomes.